Her sentences have the power to make you gasp. And you can tell that she's mad about her main character, Aaron despite his glaring flaws. It's a masterful book and it got me thinking about fiction and why writers write. I have a great fondness for first novels. Writers throw everything into their first book - passion, joy, heartache; hopes, dreams, failings - it's all there in one heady mix. With a first book you have years to craft your sentences. Once you are a published writer deadlines sneak into the writing equation. You also think about your readers - will they like your new book? Your editor - what will she/he think? Reviewers - if you are lucky enough to get reviewed. The page is never fresh. But there is nothing jaded or knowing about The Beginner's Goodbye. 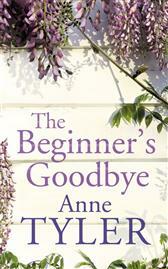 Anne Tyler is telling the story that she wants to tell in the her own peerless way. She is writing for herself, telling a tale that she just has to share. And that is how we should all write - telling the story that we just have to tell, regardless of readers/editors/deadlines. We need to get back to the voice of our 1st book and reclaim the joy that we felt, the sheer wonder at creating a fictional world and living, breathing characters. It is not enough to write a story that you like. If you had three months to live what would you want to tell people? Write that book - a book that matters.